Anyone who follows me on instagram already knows about my weird obsession with staircases. I just find them so aesthetically pleasing. There was a time when I was even contemplating starting an insta especially for my hundreds of images of stairs but my loved ones sat me down and told me I was maybe taking things a little too far. Then I came across this glorious pink stairway hiding in the depths of the trendy Peckham scene and had to see them for myself. 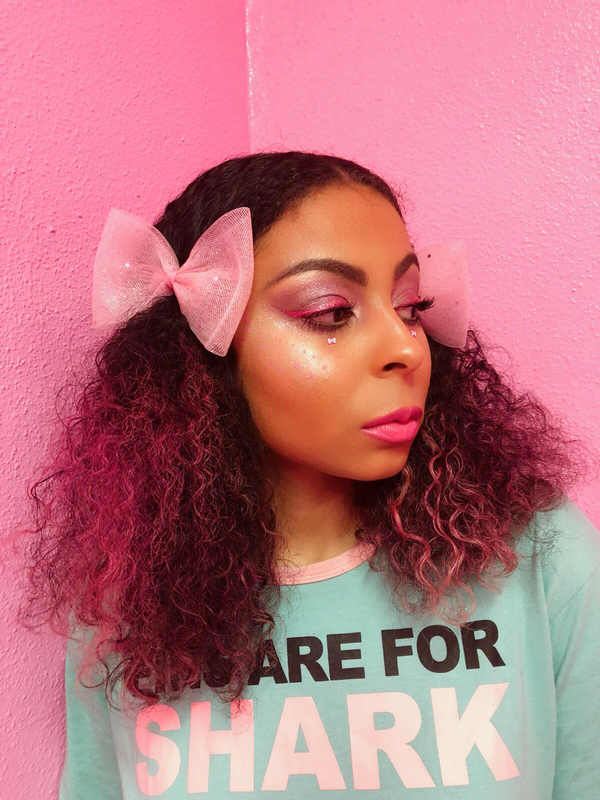 For this makeup look I used a Vivid Brights eyeliner by Nyx Professional Makeup to do my trademark wings and also painted on faux freckles. Next I stuck some little bows underneath my eyes for a little extra cuteness. The dye in my hair has faded a lot and left the ends looking a little blonde and streaky but I actually kinda like it. What do you think? Now let's talk clothes. As the staircase was already the ideal colour, I had to make sure my styling went along with it. 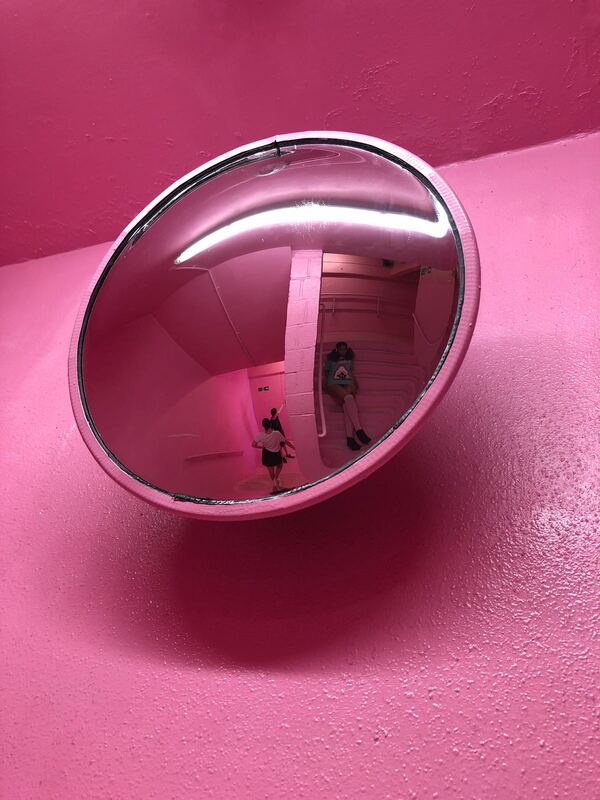 Pink is a major part of my lifestyle, I live it, I eat it (if you count pink cupcakes, that is) I breathe it...okay maybe not breathe it but you get where I'm going with this. So I thought I would take pink and mix it with a couple of my other fave things - bows and sharks! 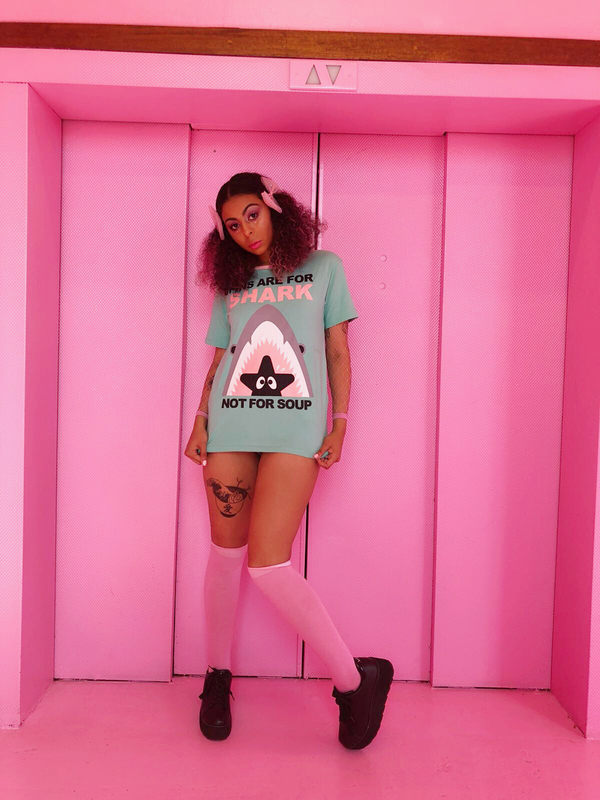 This adorable tee is from Japanese brand Mini Cream and holds a very important message: "Fins are for shark not for soup!" Sharks are my absolute favourite animals, I think they are beautiful, often misunderstood and their numbers have dwindled drastically due to a combination of damage to their habitat, finning and over fishing. We as humans need to do our best to protect the planet we live in and that starts with looking after its endangered creatures. Plus this top has pockets too for practicality! Major bonus. 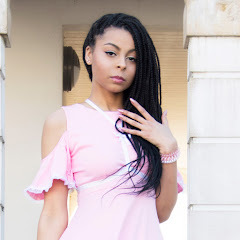 I teamed the tee with pink mesh illusion sleeves from ASOS. They were the perfect shade of pink (tones are incredibly important, k?!) and added more attitude and texture to the overall look. I donned my usual thigh highs, also in pink of course and some black platforms for colour blocking. These photos were shot in the staircase which leads to Frank's Rooftop Cafe in Peckham Levels. I highly recommend going there if you're looking for somewhere to chill and have a drink in this amazing summer weather we're having. Or just go there to take fire pics, whatever floats your boat! this outfit is so cute! love the pink theme. the background matches your outfit perfectly.